Since it is my birthday month, I wanted to focus on some things I LOVE. We don't go out to eat that often, but when I get the chance, we make a bee line to Black Angus Restaurant to get only one thing: Their fire-grilled artichokes appetizer. Oh my goodness they are yummy. Served warm and dripping with garlic butter and served with two aoli dipping sauces. I don't even get a meal anymore, JUST the artichokes. 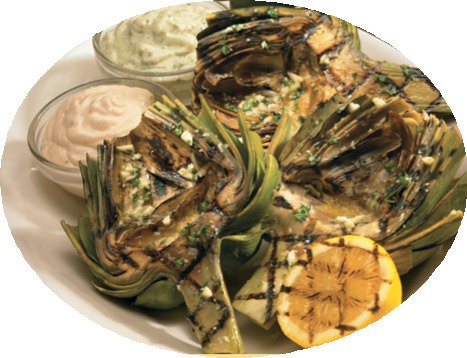 The artichokes - picture from the Black Angus menu. Have you ever seen an artichoke plant? Technically they are a perennial flower that are actually considered part of the thistle family. It really makes you wonder, somewhere, in the distant past, somebody looked at this poky bush with a thorny knob sticking out of it and thought, hey, I'd like to eat that thing??!! How in the world did it ever come about that these were discovered to be, in fact, as Alton Brown says, "Good Eats"? I planted one last year in my garden and it grew to be of a large size, but produced no artichokes. A friend informed me that they establish themselves the first year, and produce chokes after that. Well this year I am PLEASED to report that I have chokes a' growin'!! This is very exciting to me and I want to learn how to cook them just like they do at the restaurant so I can enjoy them fresh from the garden. Look I have three bulbs already!! Yea! Usually there are two ways to cook these babies. Boiling and Steaming. I asked the chef at the restaurant they prefer the steaming method. So I did a little you tube googling to find out the best way to prepare them. First rinse them off quickly and pat them dry. Cut a bit off the stem, but be sure to leave about an inch, which will make it easier to grab later. Then, you want to get rid of those prickly spines. They are very sharp, so beware. Take a pair of kitchen scissors and snip to remove them all the way around (your fingers will thank you later). The nice lady on the you tube video told me that artichokes oxidize fast, and to rub them all over quickly with a half of lemon to prevent browning. Next, it's time to steam them. I went looking all over a few different stores for that little metal "space ship" type device that steams vegetables, but alas I could not find one anywhere. Luckily, my husband is half genius and part "MacGyver" to boot, so we decided to jimmy-rig a steamer with household items we had on hand. First of all, our artichokes were those BIG monster globe type. My normal pot was way too small, so we went for our extra large pot. 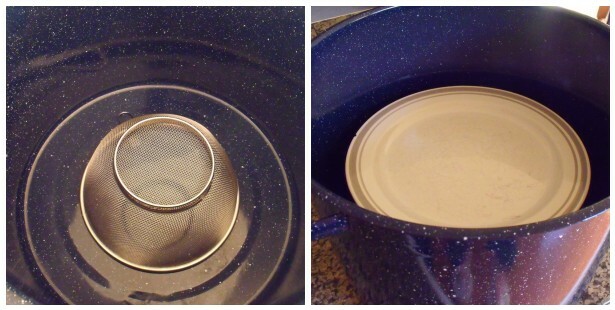 On the bottom of the pot we put our metal strainer upside down. On top of that we put a plate right side up. Next we added a few inches of water to the bottom of the pot, but not touching the plate. We also, under the plate, added the lemon juice and halves left over from rubbing the chokes, a few cloves of garlic and 2 bay leaves. This will give the water and thus the steam extra flavor. Next we put in the artichokes in on top of the plate. Note: We laid them on their side because of the plate factor. Normally if you have a steamer/spaceship you would place them face down. Next it is recommended to steam them about 45 minutes. I hate it when they are slightly tough though, so because of their size, I added an extra 10 minutes, steaming them for almost an hour. We were so excited to eat these that we totally forgot to grill them. But the grilling part is not for necessarily cooking them, just to add the tasty char marks to the out side. If you don't have the time (or the patience) to grill, eat them as soon as you can! They are great as an appetizer, on their own as a meal, or a side to steak, chicken, etc. Also after you have pulled off all the leaves you are left with the very best part, the heart of the artichoke. Be sure to saver these. I tend to cut them up like hunks of meat, dip them carelessly in garlic butter and chew slowly to enjoy the wonderful flavor. I could almost go vegetarian if I could have these every night. They are so satisfying! These have GOT to be my all time favorite green vegetable. So don't be afraid to try this alien-esque type orb, as it could easily turn out to be your go to veggie!